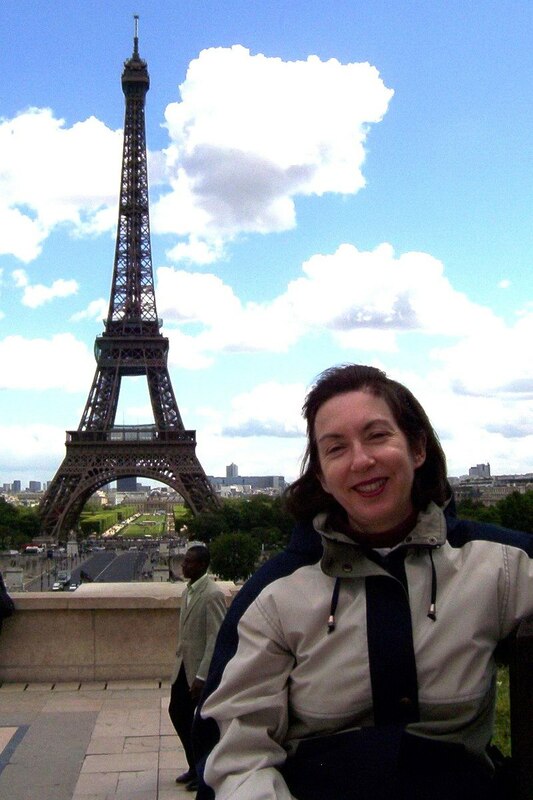 There are few places on the planet that Bob and I have visited that can compare to Paris In The Spring. And even as our picture illustrates, it does get cloudy in that City of Light, but still, it is a city where time seems to stand still, and as you walk its streets, hills and riverside, the past and present seem to meld into one. 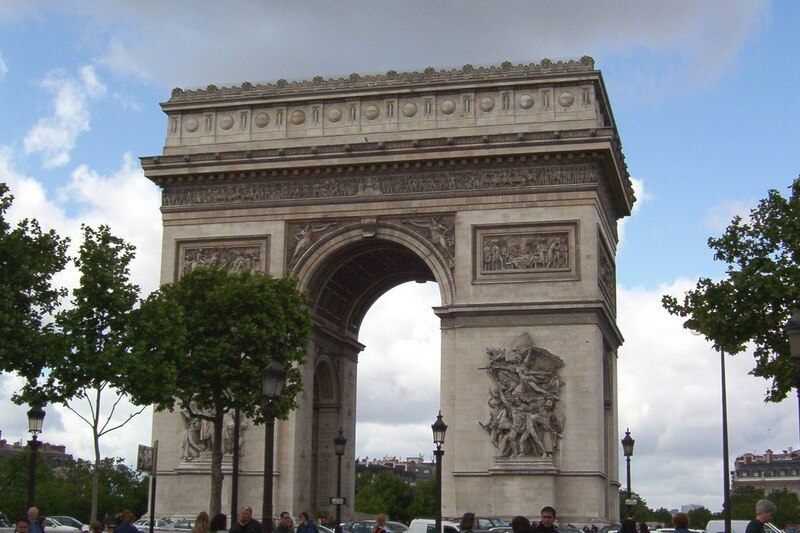 Paris is, indeed, one of our favorite destinations, especially in the springtime. 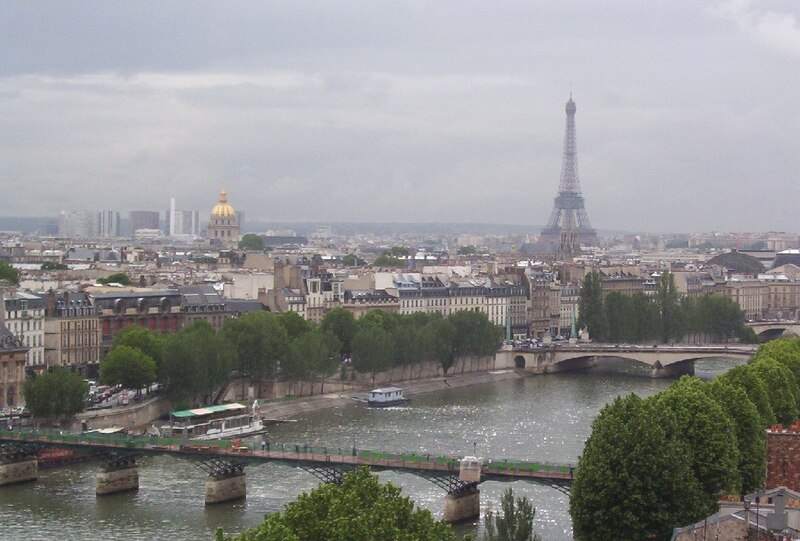 Bob and I took time to sit and let time slide by atop Palais de Chaillot across the Seine River from the Eiffel Tower. It has been over 120 years since the tower was erected, and even though we come from the city of Toronto , which has its soaring CN tower, the Eiffel Tower is, without a doubt, one of the most impressive and recognizable structures in the whole world. In the distance, prominently situated on a massive hill in 18th arrondissement, was the next stop on our morning walking tour of Paris. 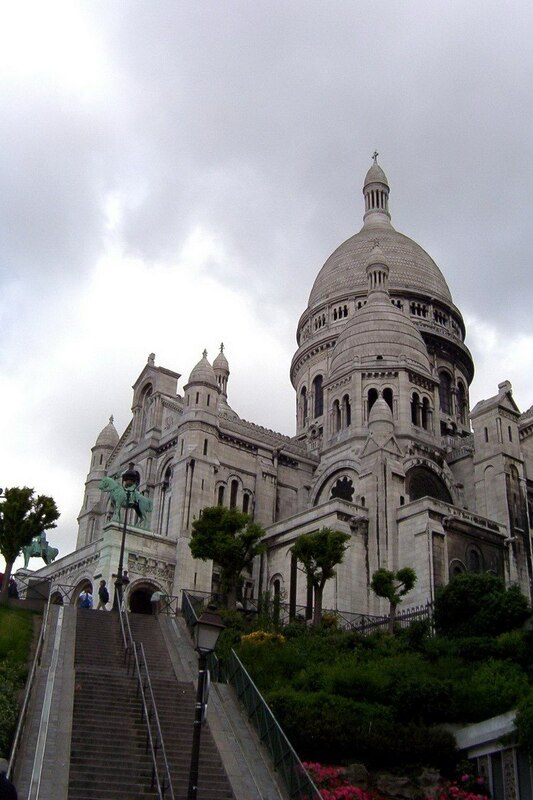 Found at the heart of the community of Montmartre (“mountain of the martyr”) is the Basilica of Sacre-Coeur. 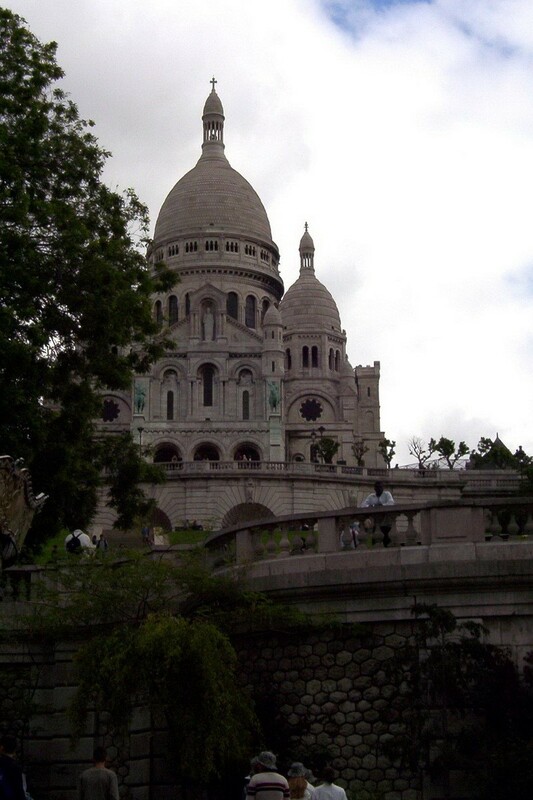 With street map in hand, we began to make our way towards Montmartre. 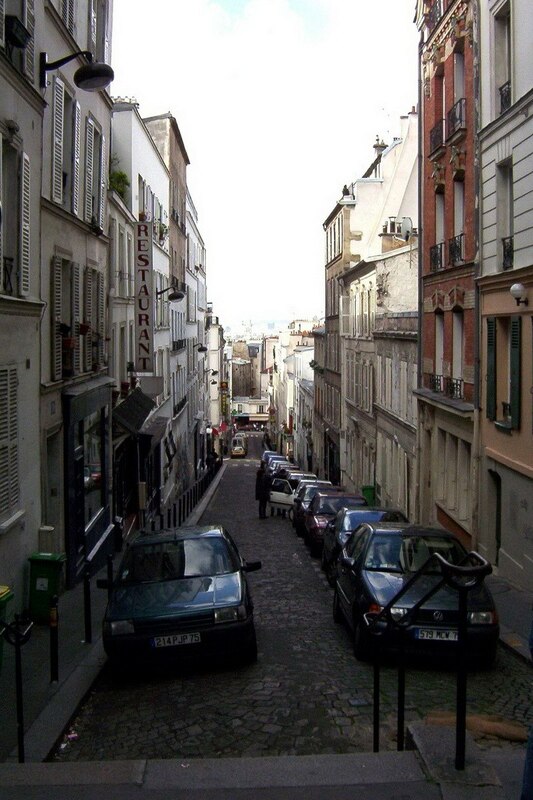 Cobbled streets led us through narrow lanes as we climbed upwards from the Seine River, reminding us of the cobbled laneways of Montreal and Quebec City ’s old quarter back in Canada. Needless to say, that is a direct result of the two worlds sharing a French connection. 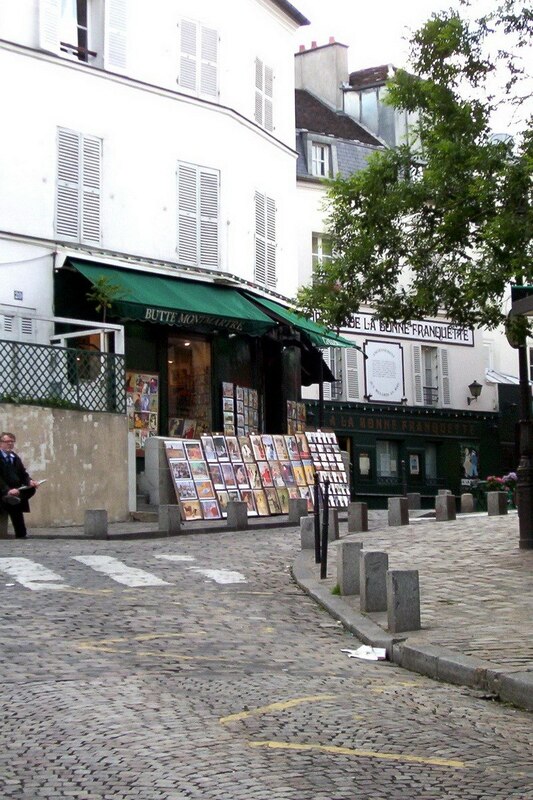 For those of you who are Vincent Van Gogh lovers, you might consider walking over to 54 Rue Lepic in Montmartre. 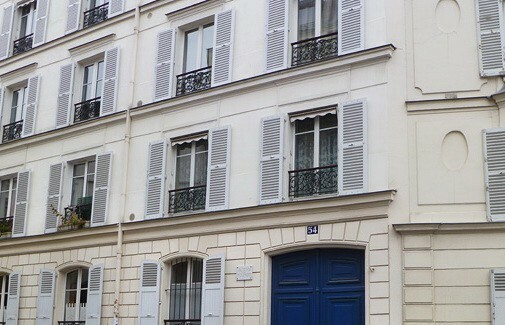 It was in this building that Vincent lived with his brother Theo between 1886 to 1888. 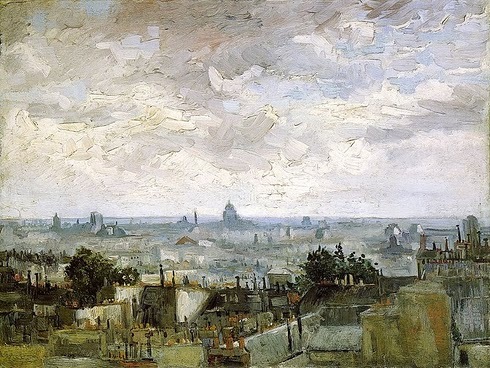 One of the paintings that Vincent painted in the summer of 1886, from the hillside in Montmartre, was this work titled “The Roofs of Paris”. Note that there is no Eiffel Tower in his painting. 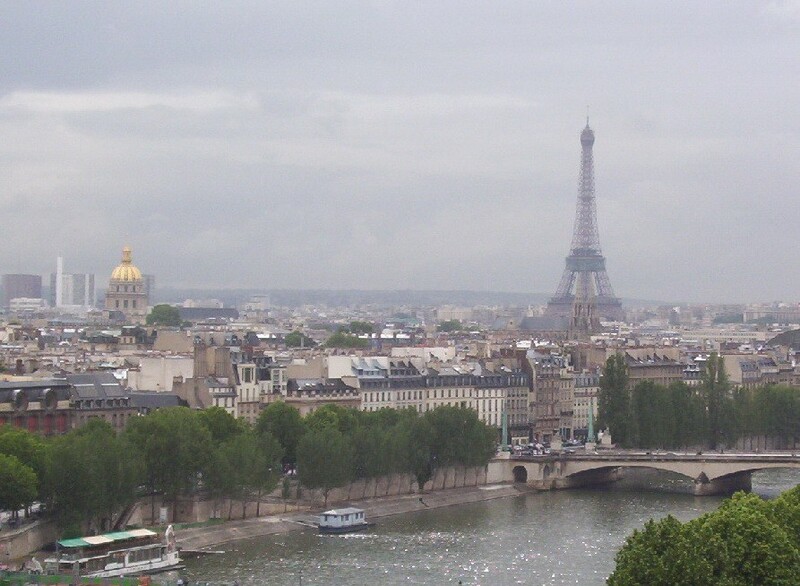 It would be three years later, in 1889, that Paris was first graced with the tower that would become part of its skyline. 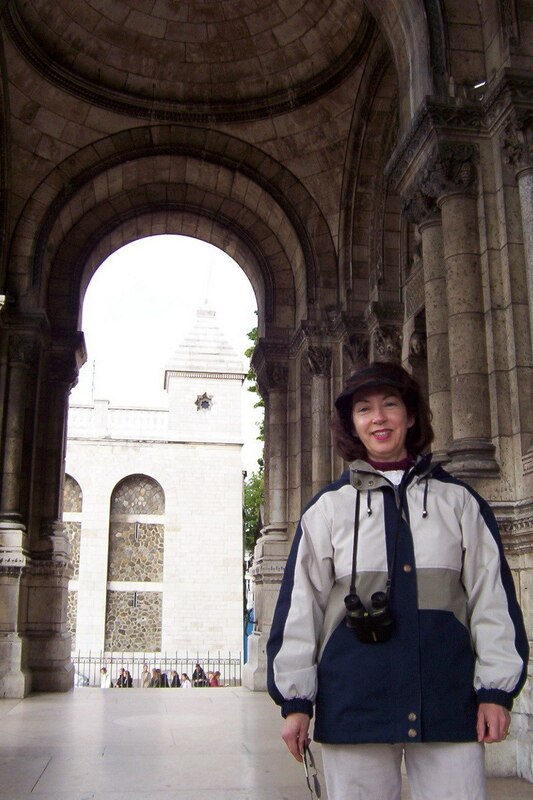 As we climbed our way up into Montmartre, we finally came to the Place du Tertre, which is just around the corner from Sacré-Coeur. 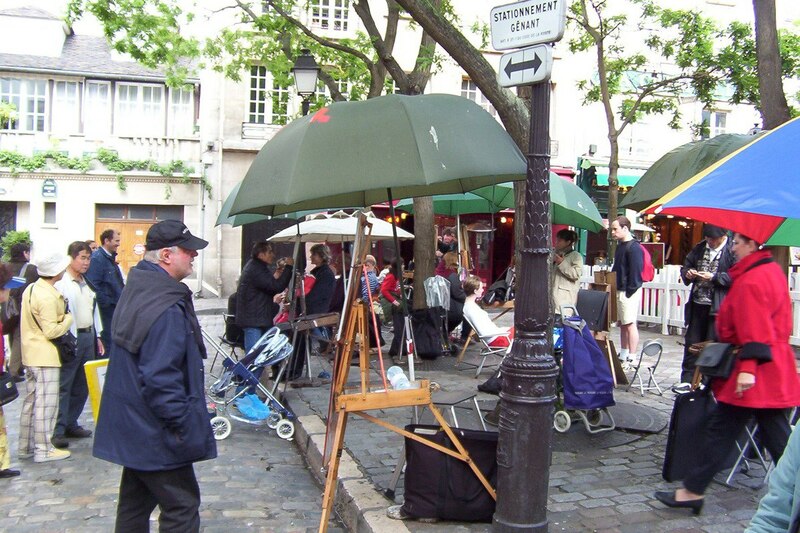 This bustling square was brimming with modern day artists busily painting peoples’ portraits. But one hundred years ago, this square and its surrounding community was where the art form of Impressionism began. That art form strongly influenced Vincent Van Gogh’s works, with its use of color and light, and it was an art form that also had a huge impact on Canadian Landscape Artists Tom Thomson and Lawren Harris, and the other members of The Group of Seven. 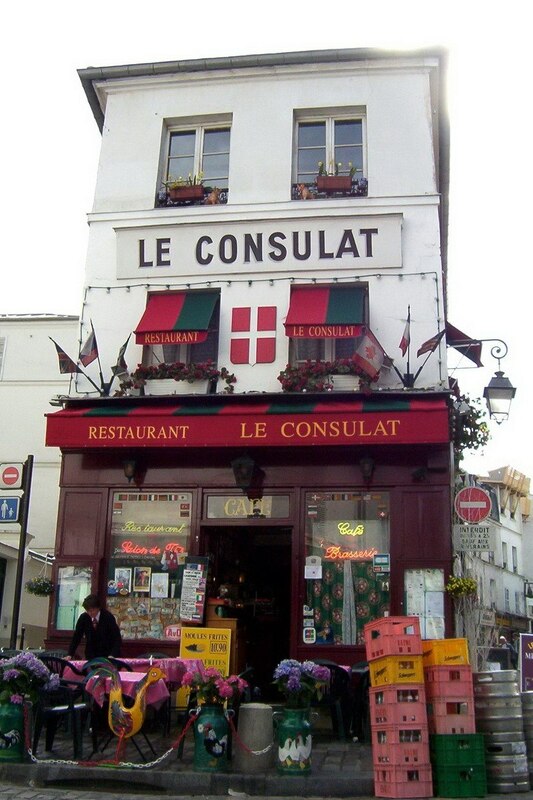 Although we didn’t have lunch in this quaint little restaurant in Place du Tertre square, we felt compelled to take a picture of the building, not just because it looks so nice, but because it is one of the original buildings remaining from the time of the French Revolution. Back in those days, people did not dine al fresco, and the square was not teeming with tourists and artists, but instead it was filled with rioters and demonstrators demanding liberty and freedom. 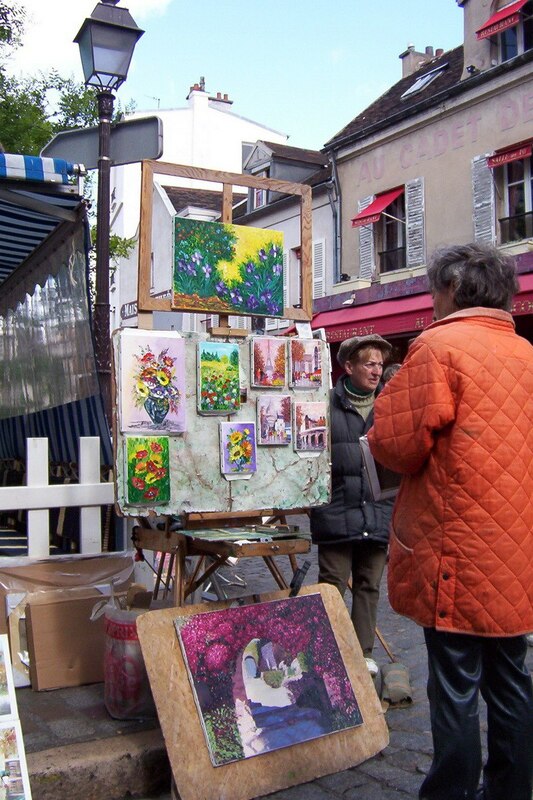 Today, the streets around Le Consulat showcase a variety of botanical paintings by the artists working there. A hundred years ago, the prevalent art form would have been Cubism. In 1910, a young Canadian Artist named Emily Carr came here to this city square to enlighten herself as to the new art form of Cubism. Emily studied the works of artists like Picasso and Braque, but after two years of studying and painting, she returned to Canada with her own style that still resonates in her amazing paintings from her day. 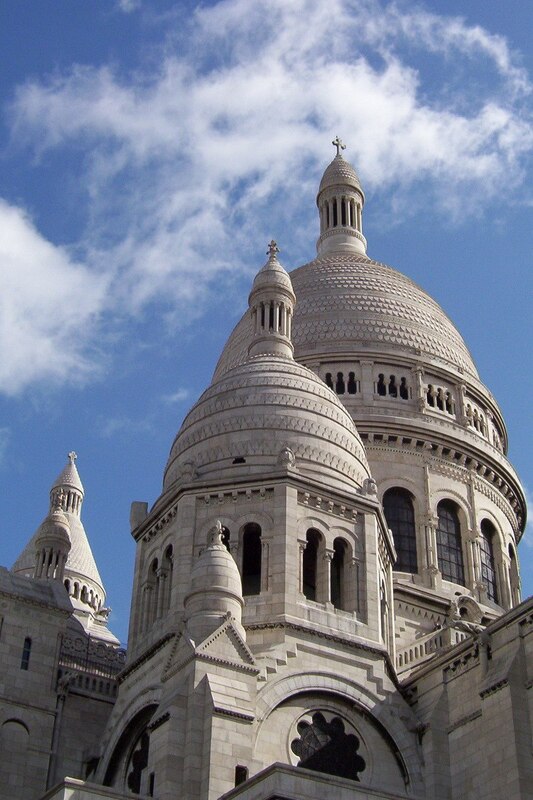 What an awe-inspiring experience to emerge from the side streets of Montmartre and find ourselves looking up the hill at the massive Roman Catholic Basilica of Sacré-Coeur. Building this church began in 1875, and continued for close to 45 years before it was completed. Interestingly enough, this church was built after France was defeated by the the Prussians in what is called the Franco-Prussian War. 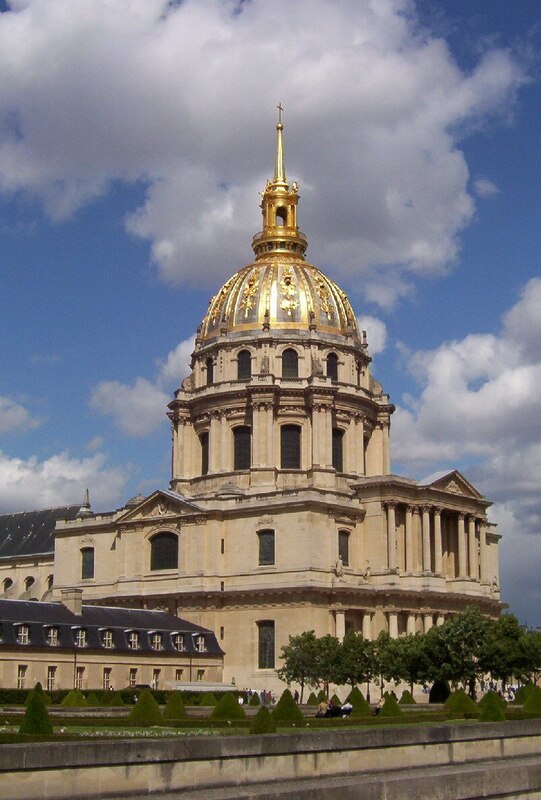 After the war, the citizens of France decided to build this church as a form of, what some call, a guilt offering and a means of curing the country’s misfortunes at that time. With grey clouds looming above our heads, I took this picture of the two bronze statues above the church’s main entrance. 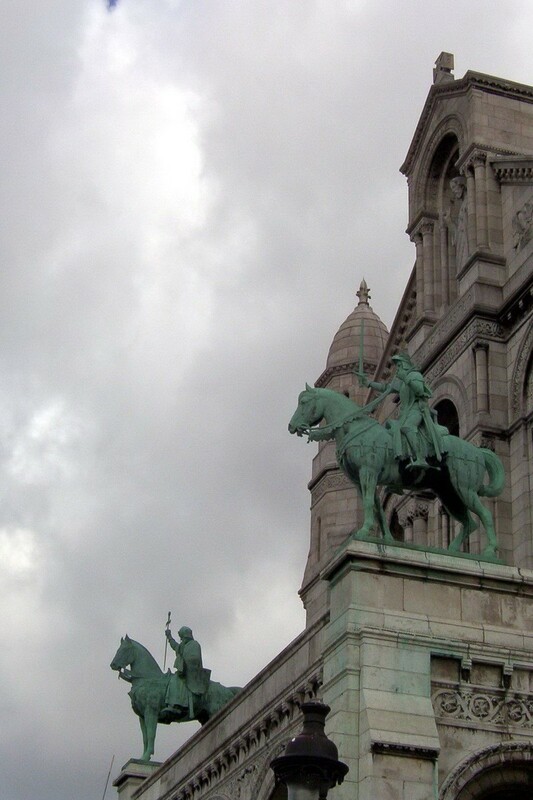 The statue in the foreground is Joan of Arc, who is sitting on a warhorse while holding a sword in her right hand. Sitting atop the other horse is King Saint Louis IX, who is holding his sword so that it looks like a cross. Both Joan of Arc and King Saint Louis IX are National Saints of France. After close to 150 years, the stone above my head at the church’s main entrance appears to have a rather dull color to it, but as you see in our next picture, the white exterior stone walls and towers have a lovely gleaming quality to them. The reason the stone is so brilliantly white is because the masons decided to use stone that is both frost-resistant and that also becomes bleached white with age. 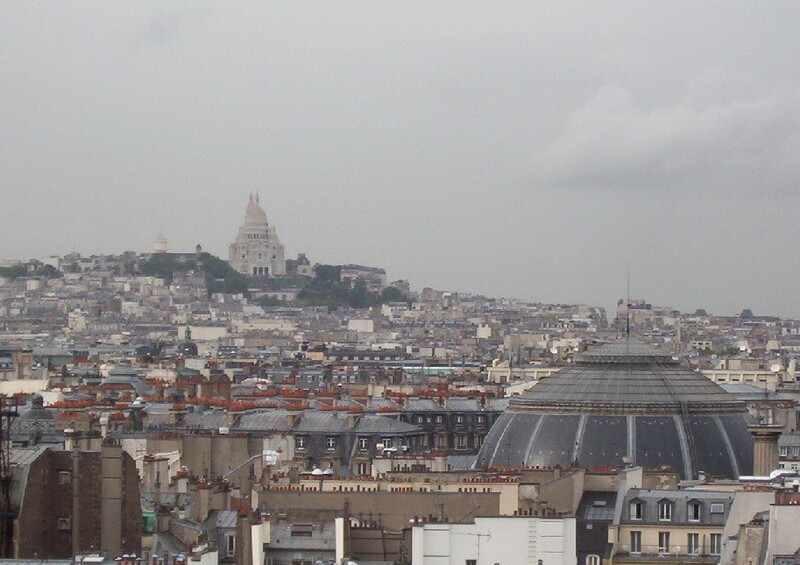 Although Bob and I didn’t take time to climb to the top of the church’s main dome, the lookout at that location provides the second highest point of view in Paris. 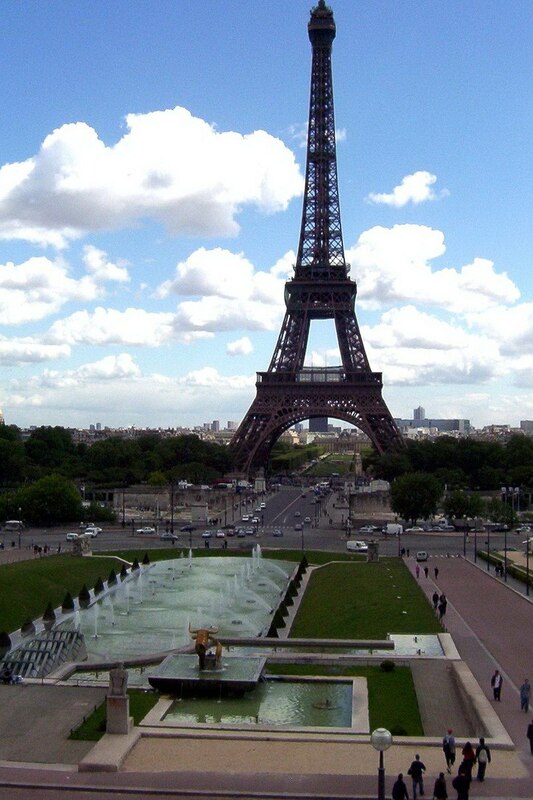 The number one highest point of view in Paris is, of course, the Eiffel Tower. We elected to stay on the ground, and from atop the hill, we had a very good view of the city and its many different domes. 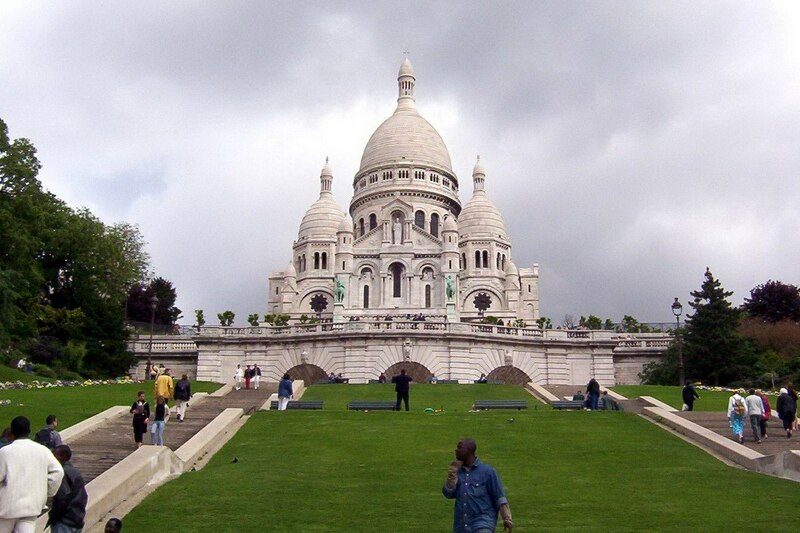 Just below Sacre-Coeur, in Square Willette, is one of the carousels that Bob and I remember well from the movie, Amelie. 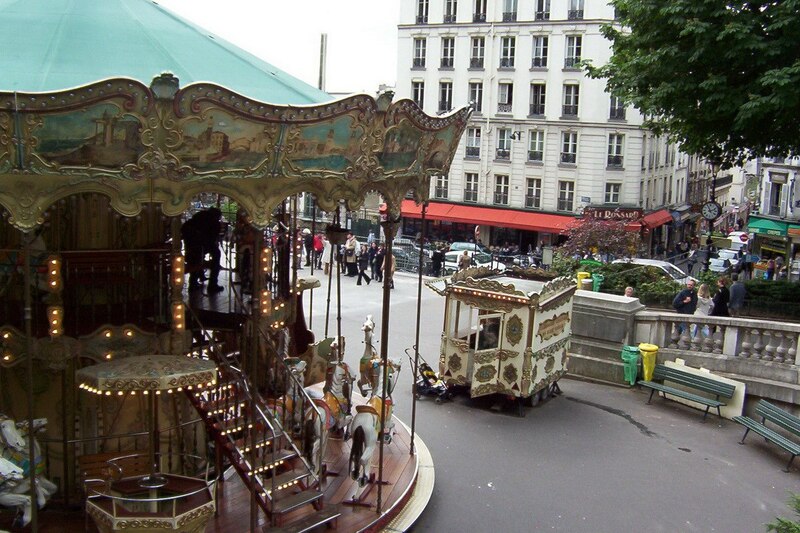 This carousel was featured near the end of the movie, when Amelie is finally trying to sort out the mystery of Nino. Try to watch the movie before you go to Paris so that you can appreciate that the scene remains pretty much in tact even today. Across Paris, we chanced to see many other carousels including those at the Eiffel Tower and in the gardens at the Louvre. With our day’s tour drawing to an end, we seized the opportunity to pop into Au Bouton St Pierre at 5 Rue Steinkerque, a store just down the street from Amelie’s carousel. 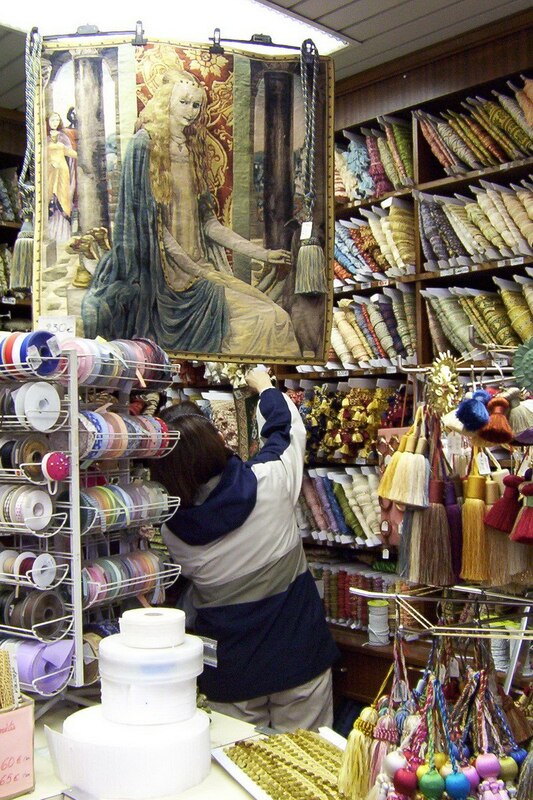 I love to do needlework, and this haberdashery sold everything from needles, fabrics, tassles, fringe, buttons and unique tapestries. I bought up what I needed to create a one-of-a-kind throw pillow that now sits proudly on our bed. 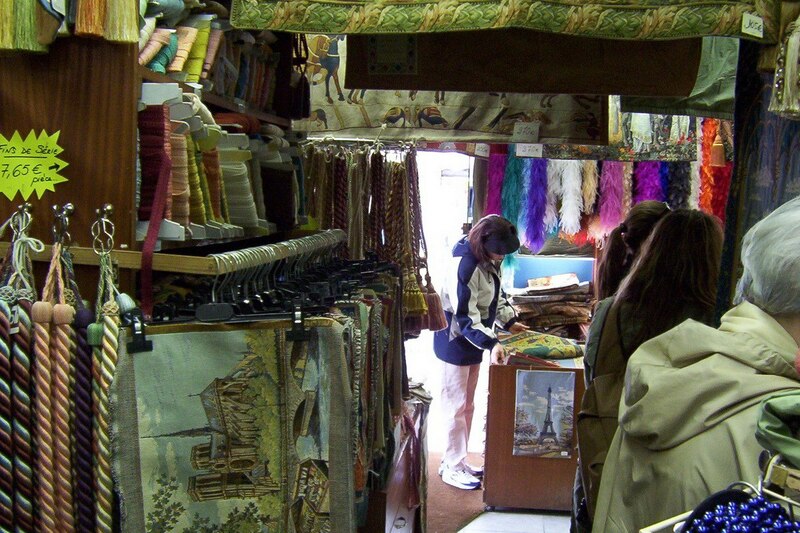 As Bob milled about the shop, I mulled over the endless choices before coming to a decision. It was a rich world of tapestries and fringed tie backs. What a wealth of resources for the seamstress in the family. 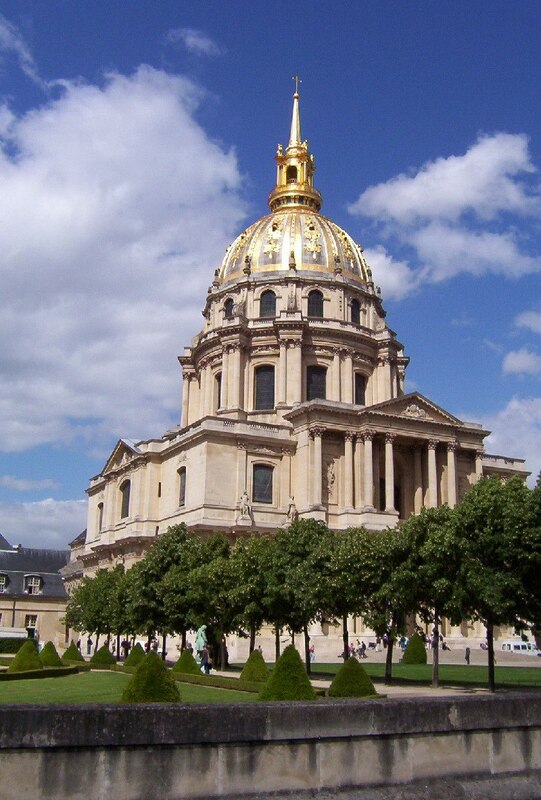 In our next Paris posting, Bob and I find ourselves at the L’Hotel National des Invalides (The National Residence of the Invalids), the site where Napoleon Bonaparte is buried. Lookin good…planning a trip to Paris this spring, making a list of the sites you saw and where to get some good photos! I’m glad our blog postings are providing thoughts on some potential sites for you to visit. 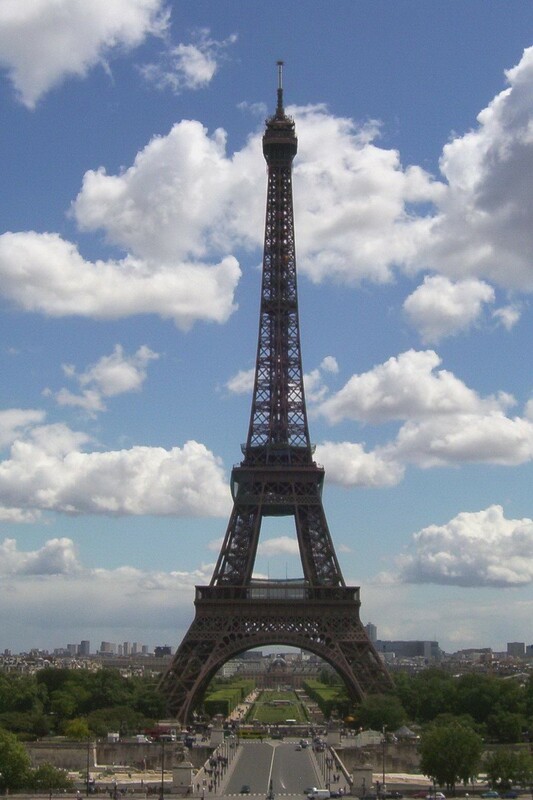 I hope you have an enjoyable trip to Paris.